Recently, I had the chance to write a book about Android Things. 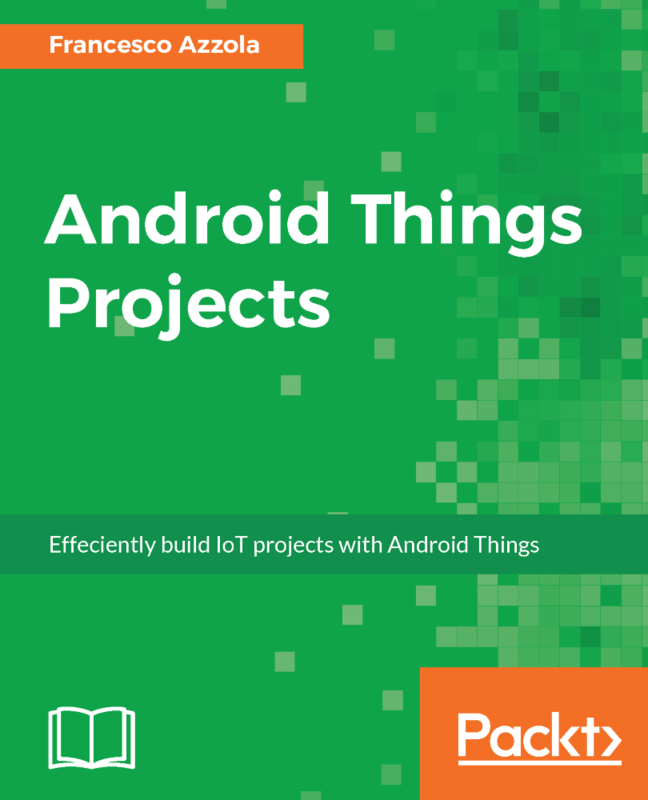 This book is titled Android Things projects. As you may already know, Android Things is the OS developed by Google to build IoT applications. At the time of writing, this is the first book about Android Things. Android Things is a branch of Android project customized for IoT. The interesting aspect of Android Things is that we can re-use our Android expertise to build IoT projects and applications without knowing much about components like LEDs, actuators, sensors and so on. Android Things OS abstracts these components and we can access them and use them in a uniform way. Even if the OS is still in beta, it will be released soon so it is important you get ready and start learning it. You will discover how easy is Android Things once you know Java or better Android. The IoT apps are developed using Java and this simplifies everything. 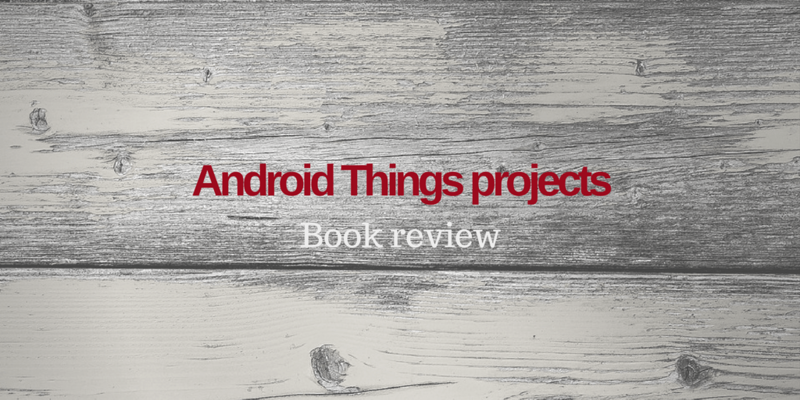 Coming back to the book, through this book you will learn all the aspects related to Android Things using real projects. The book starts introducing you to Android Things describing the overall architecture and the layers that build the OS. In the first chapter, you learn how to install the OS using several IoT development boards. After it, the book describes how to install and configure the development environment based on Android Studio. At the end of the first chapter, you will learn how to develop your first IoT application in Android Things. The app is very simple so that you can get confident with the process of development, building, and installation. This first app will let you control a LED. In the second chapter, you will learn how to use two-states peripherals like PIR sensors and so on. Moreover, in this chapter, you will learn how to use GPIO pins. The interesting aspect is that you will learn all these aspects building a real-life full-working project. The project is an alarm system based on PIR sensors. Moreover, this project uses Google Firebase Notification to send a push notification to your smartphone as soon as an event occurs. In chapter 3, you will learn how to use sensors. There are several types of sensors, in this chapter, you will handle I2C sensors. To this class belongs temperature sensors, pressure, humidity and other kinds of sensors. This chapter explains in details all the aspect you need to know to use I2C with Android Things. Moreover, it covers how to connect these sensors to Android Things boards like Raspberry Pi 3 or Intel Edison with Arduino breakout kit. In this chapter, you will develop an Android Things weather station using several sensors to monitor the environment. At the end of the chapter, you will find out how to develop a custom driver so that you can use or expand the sensor capabilities. Chapter 4 explores how to integrate Android Things with Cloud platforms. This chapter describes how to send real-time data to the cloud platform and the role that these platforms play in the IoT ecosystem. Using the data acquired by the sensors connected to the Android Things board, you will able to send data to the cloud. Chapter 5 describes how to create an ambient light system. The focus of this chapter is integrating Android Things with Arduino using HTTP protocol. You will build an IoT project where the LEDs connected to Arduino will be controlled by Android Things. In chapter 6, you will explore how to M2M (Machine to Machine) in Android Things. The chapter describes the M2M architecture and the role played by the Android Things. During the chapter, you will build a remote weather station that acquires data from several IoT board that exchange data with Android Things using MQTT. This is an important topic that demonstrates the power of Android Thing and how we can use the existing IoT boards and integrate them with Android Things in a few steps. In chapter 7, we will explore how to use servo motors in Android Things and how to control them. In this chapter, we will build a spying cam that you can control using a UI. Moreover, you will learn how to acquire images using a web cam and how to visualize them in the IoT UI. We will build an IoT user interface with several controls that you can use to control remotely your servo and the camera. Finally, in the last chapter, chapter 8, we will cover an important aspect: how to integrate Android and Android Things. We will develop several Android compani0n apps, that control the IoT app. We will explore several techniques we can use to integrate Android and Android Things like direct communication using Bluetooth, HTTP protocol and so on. At the end, you will develop several Android apps that will exchange data and information with IoT apps. Let me know your opinions about this book leaving a comment below. Awesome, the book is awesome. I am waiting for your other release or book.